With over 400 talks, drills, sessions and topics on great skiing, this website was born from our desire to filter, organize and bring to you the best bits of ski instruction, organized into many topics on developing ski technique, including a large Ski technique wiki, talks, posts as well as drills and sessions to improve your skiing via custom pathways. You can progress at your own pace, while you're skiing, not just during your regular on-snow sessions: we'll keep track of where you are, what to work on and when, complementing your on-snow instruction. Based on modern research in the science of learning and anchored in biomechanics, this content is designed to create the right mental models for effective skiing and create the A-HA moments to grow your understanding and then the most effective drills and ideas to lock it in and advance your skiing skills towards expert skiing. While books and DVDs are static expressions, this is a fully interactive environment, constantly updated based on our ongoing experience and feedback, where you can learn the most effective techniques of good skiing, track your progress, get feedback on your skiing, ask questions and get help on your path to the expert levels of effective skiing. Most of us get some lessons and then, between lessons, try to improve through "regular practice" but improvements always come slowly. So, put aside 1 hour of "deep practice" every ski day, to work on and improve your skiing, while you're having fun! Effective skiing is about leaving behind all the inefficient movements and embracing gravity. 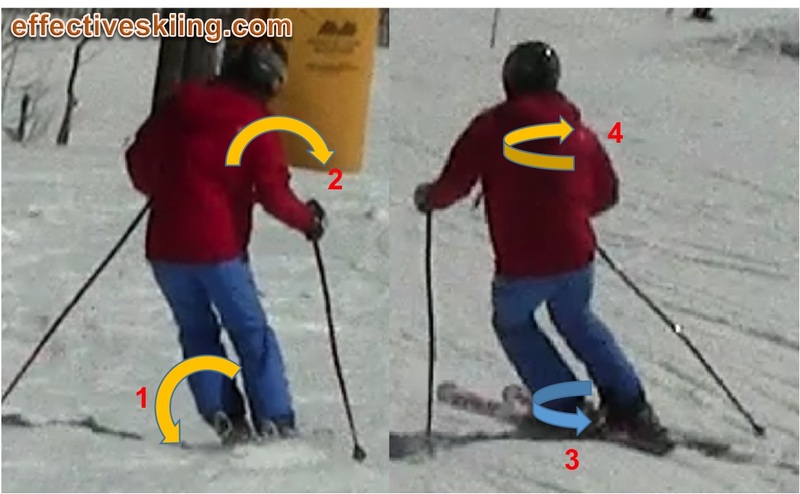 Here are the basic components of expert skiing, all captured below: the boots and skis tip and turn one way while the body tips and turns the other way! The main progression we put together here is centred around learning and refining these components of efficient skiing while increasing the range of motion, towards the expert levels, at custom levels of verbosity and detail, to suit all learning styles. The essence of effective skiing is using the design of the ski rather than gross body efforts, focusing on balance and movement, via an effective progression, so we can improve our skiing and enjoy the most that skiing has to offer. Each level is aimed at increasing your knowledge, technique, balance and range of movement, so you can tackle new terrain and grow as a skier. Not much has changed since 1972 - the fundamentals of skiing are the same. Modern skis don't require as much edge angles and pressure and do even more of the work for you, so we now focus on the effective movements to make the skis work. We see good skiing as using the equipment rather than our efforts. Good movements are directed to making the skis perform, rather than consume energy doing the same thing (turning, managing speed), leaving more for enjoyment. On skis, inefficiency manifests itself in a tendency, that especially beginners have, to muscle the skis around. For instance: throwing the body around trying to drag the skis this way or that way or forcefully twisting the skis or the upper body to change direction instead of just tipping the skis on edge and letting the ski design do the turning. This is why you hear many talking about the "turning effort". Skiing should not be effort, but fun: if you have proper boots and modern skis, you only need small movements of key joints to put the skis on edge and make them turn, just like experts do. We'll show you those movements, and even if you're a good skier now, they'll help you move up to the next realm and break through that fabled intermediate plateau. There are many ways to make a ski skid, steer or brush a turn, some more effective than others - we only focus on the effective ones, which work well with the other movements, for speed control and smooth skiing ! We have a focus on biomechanics, the science of how our bodies move, as we see skiing in terms of balance, confidence and movement : to improve, you basically learn new levels of balance, which bring new levels of confidence and allow you to reach new ranges of movement. The more you improve your balance, the more ranges and refinements of the same movements open up and you reach new levels of balance. 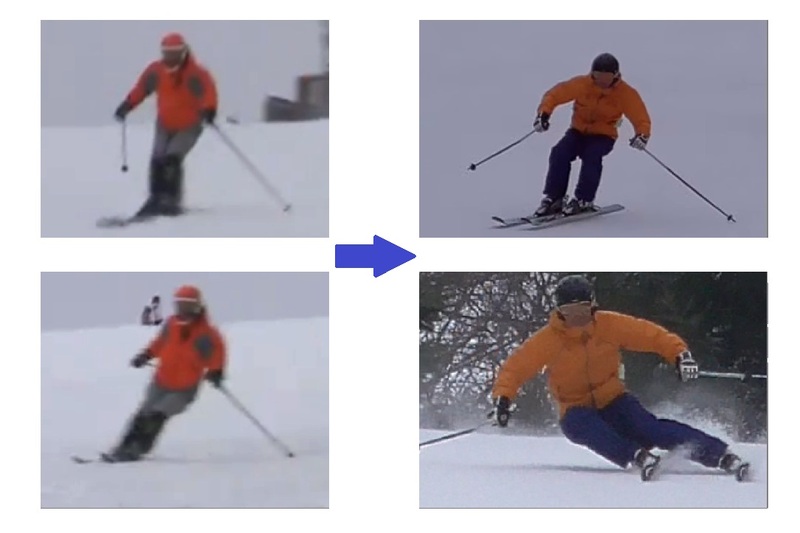 The cool thing though is that you will perform the same movements from newbie, to green to black and expert skier: the core movements of effective skiing do not change, just get to new levels of amplitude, frequency and refinement and you start to figure out how to combine them to make them even more effective. Balance, confidence and movement form a chain of improvement: as you start to increase your movements, you increase your dynamic balance, and can then move MORE. Just like dancing, great skiing is about movement and balance. The MORE, the better. Where you start makes a big difference: we will start slowly, making sure your body gets used to all the proper movements, before challenging you with more. As you improve, at every level of confidence, you will have a period of "acclimatization" where you reset at that new level, explore the new ranges of motion and  balance etc. We see skiing as a sport of movement: the skier below displays a lot of skill as he executes a simple sequence of movements to get from left to right. Just like him, you can learn these movements and refine your skiing! The levels of confidence are related to the slopes you can ski comfortably on, so you'll progress through the green, blue and black levels. The differences are the ranges of motion, which allow you to ski confidently. At each, there are three sub-levels, as we shift attention from short turns to carving to refinements. Why racers? We use many photos and videos of racers, not because this website is specialized in racing, but because of the extreme movements they make, which makes it easy for us to point out the elements and movements and for you to notice them: they provide a good contrast. If you love statistics, there's a total of 44 talks and 40 on snow sessions, plus over 50 drills and many other posts and topics that you can get access to with a paid subscription. A talk will present a technical concept, discuss it from one or more points of view and often make you experiment with the biomechanics in your living room. Viewed 11438 times ( | Print ) this page.